Memorial Day is over. The flood of stories and social media posts supporting the troops has subsided and for most people it is an ordinary Tuesday back at work. A lot of the veterans we paid homage to yesterday spent last night on the streets, and a growing percentage of them were female veterans. 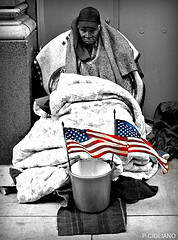 Right now, on any given night, roughly 68,000 veterans are homeless in the United States. Within that number, a group of at least 14,000 have been homeless for a year or more and suffer from at least one chronic — and costly to treat — health condition. These long-term, chronically homeless veterans typically don’t make it off the streets without specific, targeted help. When you take into account the changing gender ratio of our military forces, these numbers become even more disquieting. Officially, homeless female veterans number 3,328, a figure that doubled from 2006 to 2010, according to an estimate from the Government Accountability Office. The GAO says the data are incomplete and that the number is probably higher. Many of these homeless women are mothers, middle-aged or suffering from a disability. Unfortunately there does not seem to be available data at this point on how many of those female veterans have children along with them. The VA acknowledged in the report that there was an “acute” need to improve services for the growing number of female veterans. They are more likely to be diagnosed with mental health problems and to have suffered sexual trauma during their military service and have a greater risk of homelessness than their male counterparts, the report said. Although the overall statistics on veteran homelessness show a steady reduction over the past few years, Gowan points out that the number of homeless women veterans is sharply rising. On the bright side, we are slowly seeing awareness of the problem spread, and in some places solutions are actively being sought. In Fairfax, one organization is making strides in combating this exact issue. Final Salute was founded by Jas Boothe, an Army National Guard captain. Not only did she serve our country, but she also lost everything in Hurricane Katrina, and was diagnosed with cancer in addition to becoming homeless herself. Eventually she was able to pull out of the nosedive and is remarried with a baby and a career as a human resources officer for the National Guard. Once she was back on her feet, she decided that her priority was to give back and help those who have suffered similar trials. 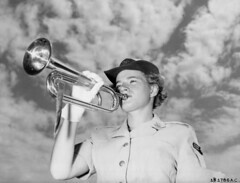 The result is a program that focuses on the needs of female veterans. The shelter can house a maximum of eight women and children at any given time, and residents have two years in which to get back on their feet. In order to be admitted to the shelter, residents must commit to job training and, if they find work, contribute 20 percent of their income toward food and utilities. Final Salute currently has a waiting list of 20. Granted that eight at a time is hardly a number that will dent the fearsome statistics we are facing, it is still a fantastic template for future efforts. It is only the first step. We must take many more if we are to defeat this great enemy facing our soldiers. In times of war, exhausted combat units requiring time to rest and recover were removed from the battlefields to a place of relative security and safety. Today, Stand Down refers to a community-based intervention program designed to help the nation’s estimated 200,000 homeless veterans ‘combat’ life on the streets. VVSD organized the nation’s first Stand Down in 1988. Since then, the program has been widely replicated nationwide. Today, more than 200 Stand Downs take place across the country every year. ‘The program has become recognized as the most valuable outreach tool to help homeless veterans in the nation today,’ according to the National Coalition for Homeless Veterans. A stand down provides a number of basic services that are lacking in life on the streets: showers, haircuts, medical and dental attention, benefits assistance, counseling, 12-step meetings, and more. Some of these things, like the simple old-fashioned shower, we take for granted, yet having them makes all the difference in the world for those who lack them. How can you find a job and pull yourself up if you cannot even get clean enough for an interview? While we cannot embed it in this post, the full 60 Minutes report is available online. You can watch it here. When looking at social programs like this, we need to remember that many of these people simply need a hand up, not a handout. The investment in our community returns manyfold in both tangible and intangible ways. This is why we always talk about our stance on this subject being a bipartisan win-win scenario. From the conservative perspective, rehabilitating the homeless back into society makes sound financial sense — as it will reduce the overall cost to the system over the long term. From the liberal perspective, the socially conscious angle is the one that is of most importance. The vital thing is to note that despite the differences in how they reach that conclusion, both sides of the political equation should find it easy to see that it is, indeed, more expensive to do nothing! Image by NYCUrbanscape, used under its Creative Commons license. Here at HUMANE EXPOSURES, we believe in the power of the Internet to inform and mobilize people. This is one of the reasons that this blog exists. Since we have just launched our new Facebook pages, we thought this would be a good time to share some of the groups and organizations on Facebook that also champion the cause of those discarded by society. Humane Exposures Publishing — The main Facebook Page for our company. Updates on new films and books as well as a variety of new items and resources. The books of HUMANE EXPOSURES PUBLISHING take a penetrating look at society’s disenfranchised, questioning how long we can ignore the broken segments of our population, and at what cost. If you stop by, please tell us what kind of content you would like to see more of! 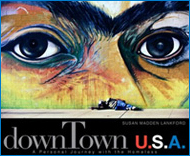 downTownUSA: A Personal Journey With the Homeless (book) — Author and photographer Susan Madden Lankford kept a journal during her daily encounters with the San Diego’s street people, observing how even the defeated, or seemingly so, share many of our hopes and dreams. 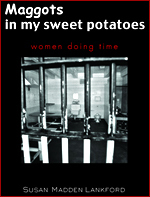 Maggots in My Sweet Potatoes: Women Doing Time (book) – Through thought-provoking photographs and interviews, the author explores the kaleidoscope of alienation, personal despair, and fragile hopes of women caught up in the state’s zeal for incarceration. It’s More Expensive to Do Nothing (film) – Important documentary film questions how long society can ignore the broken segments of our population and advocates for public awareness, correcting the underlying social issues, and improving the essential parenting skills. Feeding Pets of the Homeless — Feeding Pets of the Homeless is a nonprofit volunteer organization that provides pet food and veterinarian care to the homeless and less fortunate in local communities across the United States and Canada. How? Our volunteers collection sites receive donated pet food and deliver it to food banks and/or soups kitchens which have agreed to distribute the food to the homeless and impoverished. 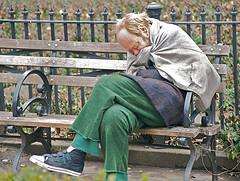 PATH (People Assisting The Homeless) — In 2004, PATH reached its 20th year of existence. From a small program operating out of a church basement, PATH has now become a large regional agency serving over 1,800 people each month. The agency has developed a model of integrated services that communities from all over the state, the nation, and even internationally have looked to for replication. The National Coalition for The Homeless — A national network of people who are currently experiencing or who have experienced homelessness, activists and advocates, community-based and faith-based service providers, and others committed to a single mission. That mission, our common bond, is to end homelessness. We are committed to creating the systemic and attitudinal changes necessary to prevent and end homelessness. At the same time, we work to meet the immediate needs of people who are currently experiencing homelessness or who are at risk of doing so. We take as our first principle of practice that people who are currently experiencing homelessness or have formerly experienced homelessness must be actively involved in all of our work. Toward this end, the National Coalition for the Homeless (NCH) engages in public education, policy advocacy, and grassroots organizing. We focus our work in the following four areas: housing justice, economic justice, health care justice, and civil rights. Real Change Homelessness Empowerment Project — Real Change exists to create opportunity and a voice for low-income people while taking action to end homelessness and poverty. National Coalition for Homeless Veterans (NCHV) — A 501(c)(3) nonprofit organization governed by a 17-member board of directors… is the resource and technical assistance center for a national network of community-based service providers and local, state and federal agencies that provide emergency and supportive housing, food, health services, job training and placement assistance, legal aid and case management support for hundreds of thousands of homeless veterans each year. Breaking Night: My Journey From Homeless to Harvard (book) – In the vein of The Glass Castle, Breaking Night by Liz Murray is the stunning memoir of a young woman who at age 15 was living on the streets, and who eventually made it into Harvard. Healthcare for The Homeless, Inc. — For 25 years, HCH has provided comprehensive health care, mental health services, case management, addiction treatment, and housing assistance for tens of thousands of Marylanders experiencing homelessness. Horizons for Homeless Children — Horizons for Homeless Children strives to improve the lives of homeless children and their families by providing the nurturing, stimulation and opportunities for early education and play that all children need to learn and grow in a healthy way. So there you have it, please let us know if you would like to see more roundups of this nature. If so, we could make it a regular feature. Image copyright Susan Madden Lankford, from the book “downTown USA: A Personal Journey with the Homeless.” Used with permission. As you walk through the streets of San Diego, or any other American city, you will see the homeless. People living rough in the urban landscape. Each one is somebody’s brother, mother, son, cousin, or spouse. In addition, many of them had fought for our country. You see them in the medians at intersections and at the bottom of freeway off-ramps. Suntanned and weary in camouflage pants, they hold magic-markered signs announcing: ‘HOMELESS VET — ANYTHING HELPS — GOD BLESS.’ And you feel empathy for them, don’t you? No matter what you think of our nation’s military campaigns, it’s undeniable that here before you is a person that once served our country, but now he sleeps outside and isn’t sure when he’ll eat next. Because of good weather and a high cost of living, San Diego has a lot of homeless people. There are 8,500 homeless people [PDF] in the county and 35 percent of them (3,000) are veterans. The relatively high proportion of veterans among San Diego’s homeless is probably due to our proximity to military bases. But, according to the National Coalition for Homeless Veterans, only a third of homeless veterans were ever stationed in a combat zone. So, why are the other two-thirds on the streets? Unfortunately, nobody knows for sure. The Rosenheck-Fontana study of Vietnam veterans shows various correlations, but its takeaways are not entirely clear. The study’s major finding was that if upon returning to civilian life, veterans had low levels of social support, non-PTSD psychological disorders, substance abuse, or were unmarried, they were significantly more likely than their peers to be homeless. And that, indeed, is the crux of the matter — how to reintegrate these people into the everyday society they have left behind? Switching our emphasis from retribution to rehabilitation is one approach that seems to consistently yield greater and more lasting results when encountered in practice. Mann spends almost half of his column on examining the Veterans Village of San Diego (VVSD). It seems like a very interesting project, one of the few that works in conjunction with — rather than in opposition to — the Veterans Administration. Just click the link under the Sources (below) to read more. Image by Ed Yourdon, used under its Creative Commons license.